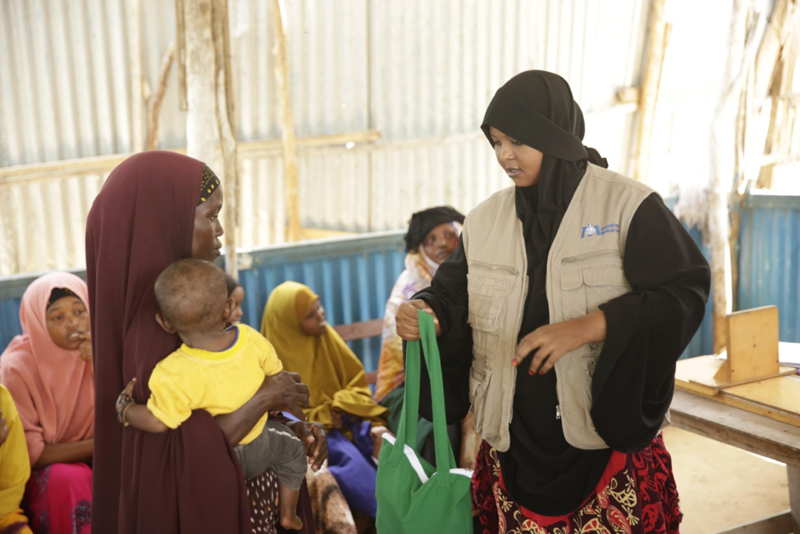 International Medical Corps provides medical care and psychosocial support to vulnerable women in five districts of Somalia, four of which have some of the largest IDP populations in the country. To commemorate World Menstrual Hygiene Day on May 28, 2018, International Medical Corps distributed dignitary kits to 40 vulnerable girls and women from an IDP camp in Mogadishu. These kits contain reusable sanitary pads, cotton underwear, laundry and bath soap, and a solar powered light. World Menstrual Hygiene Day aims to break taboos around menstruation and raise awareness of the challenges women and girls face in practicing good menstrual hygiene management. Poor menstrual hygiene practices negatively impact women and girls’ ability to reach their full potential. In settlements for internally displaced persons in particular, women are often the primary breadwinners and struggle to get food and water for their children. Whatever little they have, which often is not enough, goes towards buying food or water. Provision of reusable sanitary pads and sanitation items play a critical role supporting the dignity, hygiene, health and protection of women and adolescent girls in emergencies. During the event, Meymuna, International Medical Corps’ Social and Behavior Change Coordinator, conducted a dialogue with the women and demonstrated how to use the items in the kit, including how to wash and store the sanitary pads. She also shared key messages to the women on the importance of practicing good menstrual hygiene and the various health services that International Medical Corps offers, and encouraged the women to continue practicing healthy behavior.